This guide covers topics relevant to EMERSE system administrators. The Admin page can be accessed directly at the URL above with the right credentials (e.g., administrator privileges). Additionally, if the user is logged into the standard EMERSE application and also has administrator privileges then visiting this URL would not require a separate login. The Admin page page also contains a way to view some of the EMERSE log files, which can be useful for troubleshooting, especially during initial installation. More details about this feature can be found in the Troubleshooting Guide. EMERSE provides for the capability to have an announcement displayed to users after login (and after completing the Attestation page). This may be helpful if there is a need to communicate something to all users, such as a planned system shutdown. More than one announcement can be shown, and each announcement will be shown to every user until either the user clicks on the Don’t Show Again button or the administrator clears the announcement. If more than one announcement is entered for users, each will be shown in succession (not all together on the same announcement window). The app_config table stores the announcements to be shown to users. The user_announcment_complete table keeps track of which users have clicked on the Don’t Show Again button for each announcement. Adding an announcement could also be done by manually entering the information into the table, but it is important to make sure that each ID is unique and not re-used. The announcment_id in the user_announcment_complete table corresponds to the id in the app_config table. There may be rare cases in which a user’s User ID has to be changed (for example, someone’s last name has changed leading to a change in the User ID). Such changes can be made from the Administrator page. As an admin you can change any User ID other than your own when you are logged in under that specific User ID. This can be set, and later changed, on the Administrator page by choosing either Active or Inactive for the switch that allows for "External Authentication (Ldap, etc)". This result is stored in the EXTERNAL_AUTH column (1, 0) in the LOGIN_ACCOUNT table, and it tells the application what authentication to prefer. When EMERSE is configured to use LDAP as an authentication source (see the Configuration Guide for how to do this), it is still possible that a user can login if their password matches the encrypted credentials in the password field of the LOGIN_ACCOUNT table. If the EXTERNAL_AUTH flag is set to true (EXTERNAL_AUTH=1), however, the application won’t try to match the user’s credentials against the LOGIN_ACCOUNT table. In other words, when this flag is set to 1, the password field has no impact for the user, and only the external authentication mechanism is used. The visibility/accessibility of some user interface elements or features within EMERSE are controlled directly by a user’s set of privileges. Privileges are determined mainly through the users’ roles that are set up in the USER_ROLES table. 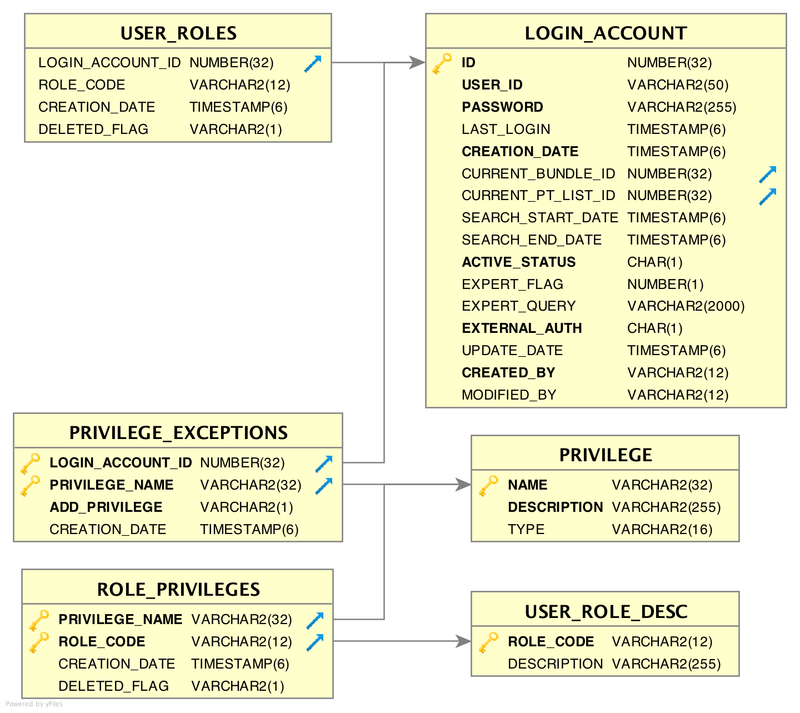 Each role is mapped system-wide to a set of privileges. The ROLE_PRIVILEGES table contains a full list of possible actions/components/features that are assigned to a specific role in the application. System-defined privileges that give access to certain features or displays of information within EMERSE (e.g., ability to export patient lists). How specific privileges are assigned to a type of role (role_code). A user can be assigned to one or more roles, and each role can have one or more privileges. A way to over-ride individual privileges for a specific user who has been assigned a role with a set of default privileges. Such privileges exceptions can be added or taken away from a user’s set of privileges. An example of what can be done using this primary "DEFAULT_USER" role is that one could disable all users’ access (assuming no other roles have the same privilege) to exporting patient lists by removing EXPORT_PT_LIST privilege from the ROLE_PRIVILEGE table. Privileges can also be invoked/revoked for a specific user by adding rows to the PRIVILEGE_EXCEPTIONS table. The ADD_PRIVILEGE column determines whether the privilege will be added to the user, or removed from the user, essentially an over-ride white/black list. Adding N to the ADD_PRIVILEGE column would revoke a user’s existing privilege, whereas adding Y to the column would grant a user that privilege even if their assigned role would not have allowed it. Table 2. Example exception in the PRIVILEGE_EXCEPTIONS table, showing the revocation of the ability to export a patient list for a single user. Allows user to create a Saved Patient list. This would be a blank Saved Patient List unless the user then added patients to the list. The privilege to add patients to the list is defined by the EDIT_PT_LIST privilege. Allows user to edit a patient list, which essentially means being able to add new patients to the list (by pasting in a set of medical record numbers or uploading a file of medical record numbers). If this privilege is turned off for a user, that user would still be able to remove patients from any list they currently have access to (it could be shared to them from another user). Allows user to view snippets from an All Patient Search. These snippets contain the search terms as well as surrounding text from the clinical notes. These snippets are also called Summaries. Allows user to move a set of patients found from running a search across All Patients to a Temporary Patient list. Access to the Temporary Patient List would give the user access to the patient names, clinical notes, etc, and allows them to search the notes in more details. The ADMIN and API_USER users who will not (or should not) be using the main EMERSE application do not need to be assigned the DEFAULT_USER role, but they will still need to be assigned either the ADMIN or API_USER roles when creating their account. The ADMIN and API_USER privileges are not defined in the EMERSE privileges tables but rather are only defined in the Spring configuration. Thus, an ADMIN user who does not also have the DEFAULT_USER role would be able to access the admin page after logging in but would not be able to access the main EMERSE application. Create a role in the USER_ROLE_DESC table called limit_access with a description such as "Only able to view the All Patient Results Summaries". In the ROLE_PRIVILEGES table, create a new row with PRIVILEGE_NAME set to VIEW_ALL_PT_SNIPPETS and a corresponding ROLE_CODE set to limit_access. Make sure that any rows in the ROLE_PRIVILEGES table related to DEFAULT_USER are deleted (otherwise the user would get those privileges as well). Table 4. A few example of what can be done using the privileges supported within EMERSE. User can identify a set of patients with an All Patient Search and can see the text Summaries (VIEW_ALL_PT_SNIPPETS). User can move the list to a Temporary Patient list to search them further (SAVE_ALL_PT_LIST). User can also save the list as a Saved Patient List for searching later or sharing with another user (NEW_PT_LIST). But, user cannot add more patients to the list (EDIT_PT_LIST). User cannot export the list to an Excel file (EXPORT_PT_LIST). User can identify a set of patients with an All Patient Search and can see the text Summaries (VIEW_ALL_PT_SNIPPETS). User can move the list to a Temporary Patient list to search them further (SAVE_ALL_PT_LIST). But because the user cannot create a new list (NEW_PT_LIST), the user cannot save this list for later. Once the user logs out, the list will be gone. User can find a set of patients with an All Patient Search, but will not be able to see the text Summaries (VIEW_ALL_PT_SNIPPETS), and will not be able to move or save the list to search it in more detail (SAVE_ALL_PT_LIST). Essentially the user will be able to get a count from that All Patient search screen. The user will not be able to create their own lists (NEW_PT_LIST), but can still search a list of patients that was shared to them by another user. The user will not be able to add any new patients to the list that was shared to them (EDIT_PT_LIST). This is essentially a 'locked down' role that will allow them to get counts and search a list that was shared to them, but nothing else. For limited access, this could be a good configuration since an administrator could create and share a list with such a user. EMERSE supports a type of query expansion we call Synonyms. These are system-suggested concepts that help users conduct a more thorough search. Synonyms can include alternative phrasings, acronyms and abbreviations, misspellings, stemming, related concepts, and more. These system-wide synonyms can be accessed by users but can only be updated by an administrator. There is no need to make your own Synonyms dataset since we can provide one: Details about the Synonyms Collection can be found on the main EMERSE website. On the website you will also find other data sets that have been formatted for importing into EMERSE, including Enesmbl gene names and associated diseases, the Human Phenotype Ontology, and others. You can download these datasets and upload them into EMERSE on the Admin page using the directions below. The directions below also describe how you can make your own Synonyms file, which may be useful if you want to supplement our Synonyms Collection with localized suggestions. Users can make their own collection of terms by building a Term Bundle, and can incorporate system-suggested Synonyms into their bundles. User-created concepts can be made available to other users through shared Term Bundles but they will not automatically become a part of the system-suggested Synonyms unless they are added by an administrator. To prepare a synonyms file for importing into EMERSE, you simply need to structure the file as a three-column CSV file. Column 1: A key value that links related concepts together. This can be anything but should be unique for each grouping of concepts. Column 2: The concept itself. If the concept contains a comma it should be wrapped in double quotes. 3 = Spelling Alternative (which could represent an actual spelling error or a spelling variation). These three Concept Types are used for categorizing how the suggestions are displayed to users and also how the terms will be matched. In the example above, there are two groups of concepts (group 1994, and group 2030). Group 1994 shows that one of the concepts is in double quotes since it contains a comma. Group 2030 also has mix of all three concept types: seven regular Synonyms (Concept Type = 1), one Related Term (Concept Type = 2), and five Spelling Alternatives (Concept Type = 3). For all matches, the key values are obtained (a concept may belong to more than one grouping and thus may have more than one key value). Figure 2. Synonyms shown for the term 'adenomatous'. Note that the terms are organized into three categories, based on the concept type: Synonyms, Related Terms, and Spelling Alternatives. This organizational scheme of three Concept Types allows for some terms to be suggested based on a user-entered term, but supports the ability to have a one-way match to reduce extraneous matching when desired. For example, if the terms entered is 'adenomatous', the term 'polyps' will be displayed as a Related Term (see figure above). However, since in that grouping (group 2030 in the above example) the term 'polyps' is not a Regular concept type (i.e., it is not Concept Type 1 but rather Concept Type 2) then it means that a user-entered search term of 'polyps' will not match to anything in that 2030 grouping. This can be seen in the figure, below, where none of the terms in group 2030 are displayed to the user when 'polyps' is entered as a search term. Figure 3. Synonyms shown for the term 'polyps'. 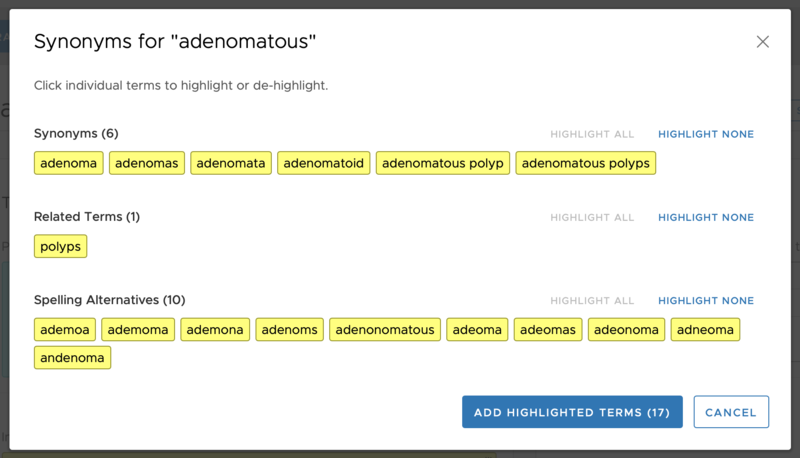 This shows that the 'adenomatous' term is not displayed to the user since 'polyps' in the 'adenomatous' concept groups is not a Regular synonym type but rather is a Related Term type. A Synonyms file should be prepared as a 3 'column' CSV file as described above. To upload the file, simply login to the administrator page and choose the Synonyms tab. Then click on the Choose button to select the CSV file. After the file is selected press Upload. Figure 4. The administrator page for uploading the Synonyms file. No feedback is provided while the file is loaded, but when it is complete a Results page will be shown, which will report on the total number of rows entered and any errors found, as can be seen in the figure below. Figure 5. The administrator page for uploading the Synonyms file, showing the feedback provided to the user. EMERSE is currently designed to replace all of the synonyms data when uploading a file. There is no append function. Note that the specific version numbers of the war file may change based on the current version of the EMERSE distribution.